A comment on my last post at No Unsacred Place brought up the itchy, urushiol-soaked leaves of poison ivy and poison oak. I am quite sensitive to all of the plants that exude this compound, and admittedly all they’ve inspired in me has been much cursing and complaint on the occasions we’ve had too close an encounter. Elinox, the commenter who brought these plants up in the first place, mentioned the idea of a shadow totem. A “shadow totem” is a newer concept that seems to be an odd extrapolation of Jung’s Shadow archetype; a shadow totem represents or embodies something that we fear or are otherwise uneasy with. It’s not a concept I work with myself as I find it a little too much of a pigeonhole, but I agree with the general idea that sometimes we have to face some really difficult things in our paths. So I meditated some with Poison Oak today to consider our relationship–such as it is. 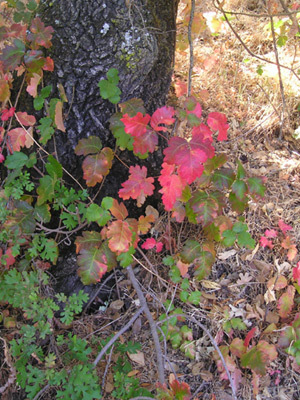 Like thorns and other obstacles, Poison Oak and her kin developed urushiol as a way to avoid being eaten by animals. It does mean, of course, that poison oak is not an especially cuddly plant, and the totem was correspondingly strict about personal space, though pleasant otherwise. She’s actually quite friendly; she just maintains very firm boundaries. And that’s a very important lesson for me, especially as a woman in a culture where women are still often treated as though our boundaries don’t exist. If we object to catcalling, or sexual harassment, or any of a number of other nonphysical boundary violations, we’re told that we’re “bitchy” or “making too big a deal about it”. If we’re assaulted or raped, there are people ready to question what we did to deserve it–were we drunk, or scantily clad, or walking alone at night, or hanging out with the “wrong people”? In the same way, simply for defending her boundaries with integrity and creating a consequence for violation, Poison Oak is vilified. How much do you hear about this plant for any reason other than “this is what it looks like–DON’T TOUCH IT!”? This goes beyond women, too. There are so many situations every day where people are expected to yield to those who are more powerful, who have no respect for their needs or integrity or safety. The abuse of power is rampant on all levels of American society and beyond. It’s no wonder, then, that so many put up fierce defenses, even against those who mean them no harm. And it can be easy, if a person doesn’t let us in as far as we want, to vilify them for not giving us what we demand. Poison Oak also told me to examine my own boundaries. I sometimes feel a lot of guilt for maintaining the boundaries that I do. The older I’ve gotten, the more of an introvert I’ve become, and I’ve sometimes gotten criticism for that. More extroverted people don’t always understand that introverts’ quiet and solitude isn’t about them. There will always be people who feel entitled to my personal space–strangers who don’t understand that it’s a problem if they suddenly come up to me and start flirting, or those who feel entitled to fill an entire residential block with the loud, bass-heavy thumping from their stereo system. These people tend to complain if someone challenges them, and it can be hard to stay true to my own boundaries when they’re trying to paint ME as the bad guy for standing my ground and insisting on my comfort. And there’s only so far I should allow others to make comment on my spiritual practices. I’ve been spending a lot of time lately trying to defend myself against people who criticize me for being an American of European descent trying to put together an animistic practice, and from people who are uncomfortable with or even incensed by my work with animal parts in art and spirit. While being aware of what others are saying, and my own power and privilege, is a good practice to cultivate, there is a point past which I need to maintain my own integrity and preserve the roots I have set down to give myself more balance. However, I also need to be mindful of the negative effects that my own “urushiol” can have; sometimes boundaries can be too tight. I sometimes have to make a real effort to get out and be social, not out of any fear of socialization, but simply because I am so comfortable in my personal space that I simply neglect to come out of it at all. Over time, others feel they simply can’t approach me, and so sometimes I need to demonstrate that yes, I can be sociable! And in some ways I grew up with a certain level of entitlement that’s been hard to shake even at this point of my adult life. I was raised in a town where people were very prickly to each other, where being bullied taught me that everything is a personal offense, and where people always looked for someone to blame for whatever went wrong, even something as small as a delay in traffic. Poison Oak’s “passive” defense isn’t an open attack, and she doesn’t go out of her way to cause trouble. It’s something to keep in mind as I continue unraveling this unwanted part of my past conditioning. By the end of the conversation, I saw a good deal of myself in Poison Oak, and vice versa. While I’m sure I’ll be unhappy the next time I end up with an itchy red rash from brushing up against her progeny’s leaves, I won’t blame them at all. Urushiol is only the protection that Poison Oak has developed over time, and it’s really rather effective. If I can’t touch or pick poison oak like I can clover or dandelions, it doesn’t mean the itchy plant is a bad one. It just means I need to respect that plant’s boundaries as much as my own. Regarding that last post–I was NOT speaking ONLY of human beings, or only recent human cultures. I certainly wasn’t saying that non-urban or less centralized cultures are more “wild”, and I’m well aware that we do not hold the monopoly on technologies and innovations and correct ways of thinking. That sort of ethnocentricity is NOT something I wish to be associated with, thank you. When I was speaking of the wildness and risk inherent to life, I was speaking of ALL life that has ever existed on this planet, of which humans–ALL humans–are a tiny, miniscule fraction. For most of these beings that have EVER existed, life was/is a much riskier proposition than we generally experience. And when I say “we”, I mean those of us who live relatively comfortable, secure lives. So I’m rather frustrated that people translated this into such an anthropocentric view, forgetting that I was speaking of much more than humans. Please re-read the previous post. I spoke quite a bit of “living beings”, and nowhere was I only comparing the standard of living I and others enjoy ONLY to other human beings. Nor was I saying that even this comfortable life is without risk. But I feel risk is more resonant of our wild heritage–not just HUMAN heritage–than the outer trappings and symbols I spoke of. All this was was some musings I had about what (usually white, urban) people like to call “wildness” like wearing dead animals and worshiping nature deities, compared to the risks of being a wild animal; and drawing casual, loose comparisons between the *slightly* greater risk of self-employment and how that makes me feel a little closer to the wild because I could see similar challenges between the ebbs and flows of my income, and the successes or failures of a day’s hunt–by ANY predator, not just human ones. For those of you on Tumblr, my book Skin Spirits caused some debate and discussion, some of it heated, over there. So in an attempt to try to salvage something good out of all of this, I’m giving away a free copy of the book–just reblog this post linked here on Tumblr! We Do Not Return to Nature. We Are Already There. and Further Thoughts on Nature, Wilderness, and Urban Sustainability, two essays in which I explore what “nature” really is and how we, even in the deepest parts of cities, are still a part of nature. Recently I was given a very old jaguar hide as a gift. I was rather stunned, as I had been told by the person who gave it to me that it was a “spotted cat hide”, but not specifying which sort. So when I opened the package and saw the distinctive rosettes, my heart skipped a beat. See, Jaguar is what I call a Silent Totem. Silent totems are totems who are not necessarily active participants in my life. They don’t come to me in dreams, and I don’t call on them in rituals. But their influence is still there in the background, and the distance doesn’t always mean a weak “signal”, either. Sometimes a silent totem need not do anything but be present and observe in order to make a great impact. Take Jaguar, for instance. Jaguar is connected to my shamanic practice, not as an active guide, but as one who represents the gravity of the work that I do. I am reminded that the foundational practices of shamanism were forged in much more dangerous times and settings, in places where being attacked and eaten by large wild animals was (and is) a real threat, where the shaman was the main line of defense against illnesses where there were no refined antibiotics and other high-tech medicines, where the life expectancy was much lower than it is for me. Jaguar is also the reminder that the spirit world is not a safe place to be, and that although I have good companions on my journeys, none of them are a complete proof against threats by malign beings. And all it takes is a glimpse, in the back of my head where the wild things are, of black spots on yellow fur sliding through dappled underbrush–for just a moment–to make that reminder clear. There are other silent totems as well. Anna’s Hummingbird can be felt in periods of high energy, where I’m dashing from one task to the next as quickly as I can, drawing on my reserves to meet the demands at hand. Common Octopus carries the ephemeral nature of mortality, to not take for granted what is here before it’s gone, and to not underestimate something short-lived–in other words, to seize the day and make the most of it. None of these or other silent totems normally come out of their places in the shadows of my mind, but they are there nonetheless. I will be interested to see whether Jaguar decides to come forth; there was a decided “spark” when I first touched the jaguar hide, and I felt an almost overwhelming energy for just a moment. If I do start more work with Jaguar, it promises to be intense.